Lately, I’ve been a bit bored with my usual pursuits, and I ended up trying a couple of new creative outlets. Gel printing was one, and the other – weaving. I experimented with a cardboard sheet, some reclaimed yarn from a UFO, and a tapestry needle. I cut notches into the cardboard to use as slots for warping the yarn. I wanted to see if I’d like the repetitive back and forth action of weaving. It wasn’t bad, though it might have been a tad too repetitive. I’m guessing that was because I had no pattern or design to follow. I love the cheerful colors! I made two striped placemat-like rectangles, the first with taut warp threads and a little less squishing of the weft thread, and the second with less tension in the warp threads plus more squished weft. The second one turned out just a big longer, if you haven’t guessed yet. 🙂 It was fuller but also less neater. I like the weaving feel of the first attempt better, but I’m not sure if the warp was too tight. Hope that in time, I’ll learn what the right tension is. Speaking of tension, beginner weavers need to be cautious about not working the weft too tightly. Tight weft causes the warp threads to get pulled towards the center, and the rectangle ends up with a narrower center compared to the edges. I was pleased to see that I had managed mostly constant width in the rectangles – not bad for a first attempt. I made and fixed my first mistake too – I missed a warp thread and had to undo a couple of rows of weft to fix it. I miss knit-fixes that involve undoing only a column (or two) of stitches! 😛 But now I wonder if I could have just left the mistake as is, and it would eventually have gotten hidden. I could retain these rectangles as placemats, or combine them with one or two more to make a table runner. Regardless of which route I’ll go, I thought a single-crochet border for each rectangle wouldn’t hurt. I’ve not decided yet if I like weaving, but I’m definitely going to try some more “crude” creations before I start wondering if investing in a loom will help me decide better. 😉 What do you think – some basic tapestry after the third placemat/runner rectangle? After that satisfying finish, I’ve completed designing a rectangular shawl for my sister. We’re using a single color for this project – which is a change from my previous shawl project, the colorful Oshara Shawl – so all I needed was a lot of textured stitches, which I’ll use for sections of the shawl. More on this one when I work on it enough and click pictures of it! I’m also working on the August section of the Linen and Threads Mystery SAL – I’ve just finished figuring out the colors, and have started stitching with my main color. That’s it from me this time. I’d love to hear how your projects are going! I was watching a movie while I worked on this motif and am not even aware of what exactly I did, but I’m pretty pleased with this piece. 🙂 I started out with a magic loop, and worked circles of chain stitches, single crochet and double crochet until it got big enough. My mom loves the center of the motif, and I agree it looks good, but only because the rest of the piece supports it. That’s what I felt when I started working on a placemat using my stashes of tan and black light weight yarn. And that’s what I feel after I’m all done with the piece. The colors just complement each other so beautifully. I made my hexagons exactly like Kara shows, but with only two colors. I started with (2dc, ch1) x 6 in a magic ring using my tan yarn. 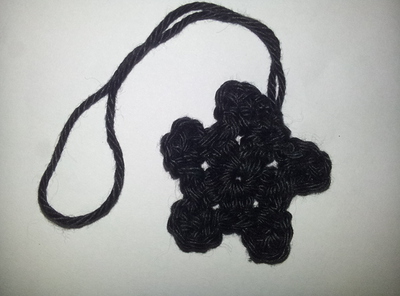 I then made (2dc in chain-space, ch1, 2dc in same chain-space, ch1) x 6 with my black yarn. Switching back to tan yarn, I made (2dc in corner chain-space, ch1, 2dc in same chain-space, ch1, 2dc in next chain-space, ch1) x 6. 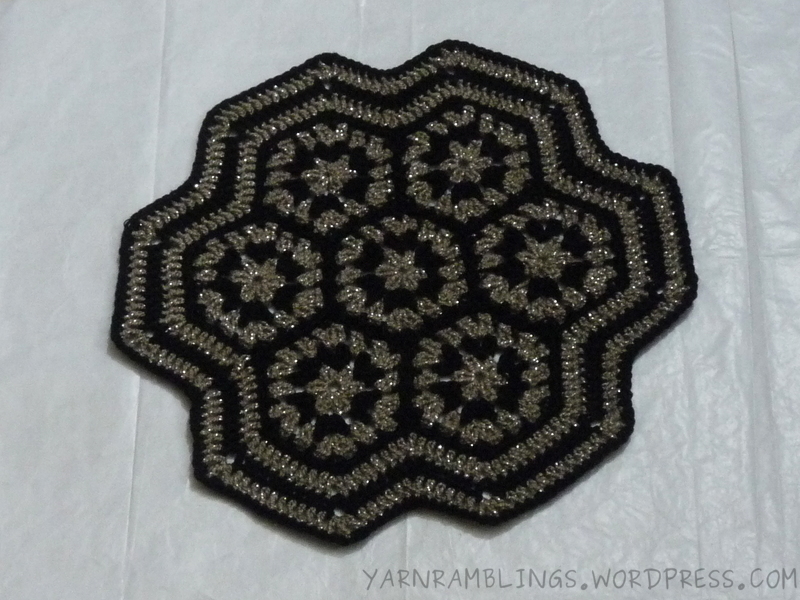 Finally, I used my black yarn as the single-crochet join-as-you-go edging to the hexagon. I made 7 such hexagons, joining them as I made them. I single crocheted around the hexagon bunch, making (1sc, ch1, 1sc) at the convex corners and (sc 2tog) at the concave corners. That made all the black edgings look uniform. With careful weaving-in of the ends, the piece is quite the reversible one! Time to talk about decorative pieces! And scrap yarn! And how scrap yarn is wonderful for making colorful decorative pieces! The inevitability of working on a yarn project is that after the project ends, there’s yarn left over. The problem is always that this yarn is too less to use for the usual projects, but too much to throw away — blame it on our accurate yardage measurements… 😉 The solution? Collect scrap yarn from a whole lot of projects and use them together to make something colorful and decorative! And what better to work with various colors than the beautiful granny pattern? 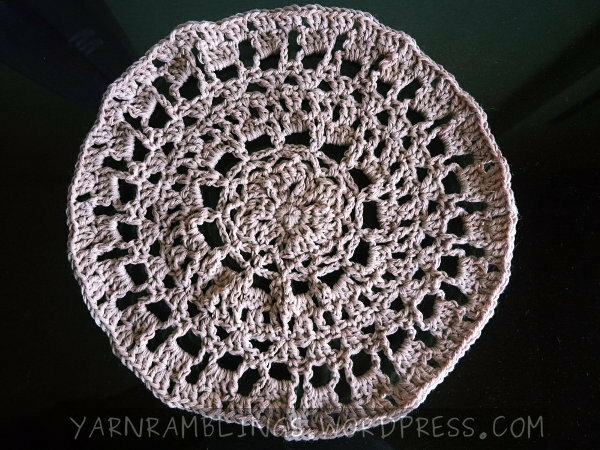 Granny patterns have had their highs and lows in the crochet fashion world, but not many can deny the prettiness of things made by attaching small granny squares together. This is a decorative piece that I made from scrap yarn — a red-to-brown self-striping yarn, a blue-to-green self-striping yarn, and a regular green yarn — left over from three different projects. 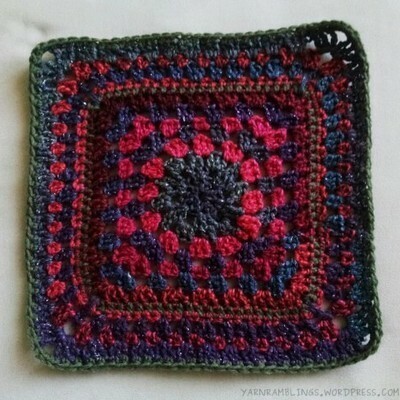 I started out with 2 rows of granny circles, then began morphing it into a square. 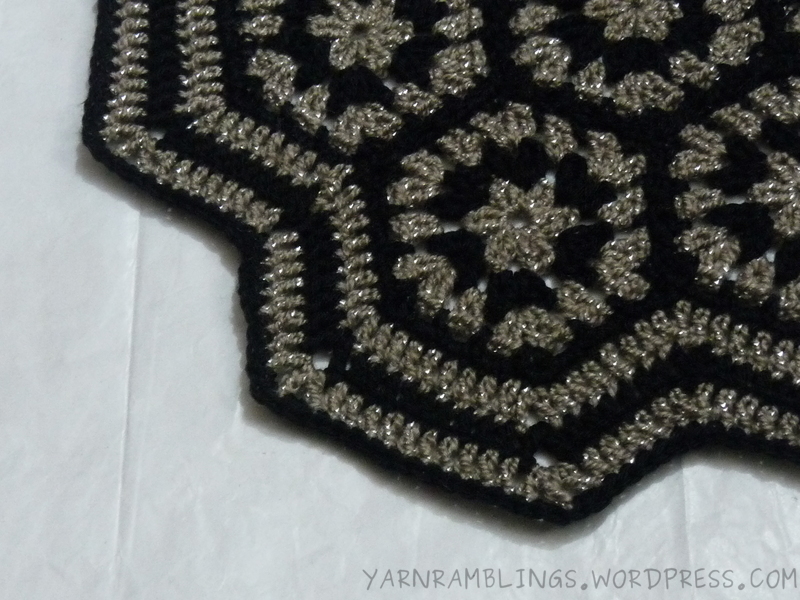 The granny pattern here has one chain stitch between every 3 crochet stitches, and two chain stitches at the corners of the square. As is evident, I’ve used not only double crochet stitches but also half-double crochet stitches; and some rows are not even granny patterns, they’re just regular single crochet stitches. To put it mildly, I just went crazy with this piece. I finally stopped only when I finished two of the three yarns. I didn’t work much on my cardigan project this past week since I was busy trying to figure out stuff for my new photo-blog, so I thought I’d write about a micro-project that I finished instead — a crocheted keychain ornament. I finally got my house key copy from my dad, so I thought of using some yarn left over from a recent project to make a keychain ornament. The result — a goth-style black flower! It wasn’t flowery in the beginning. 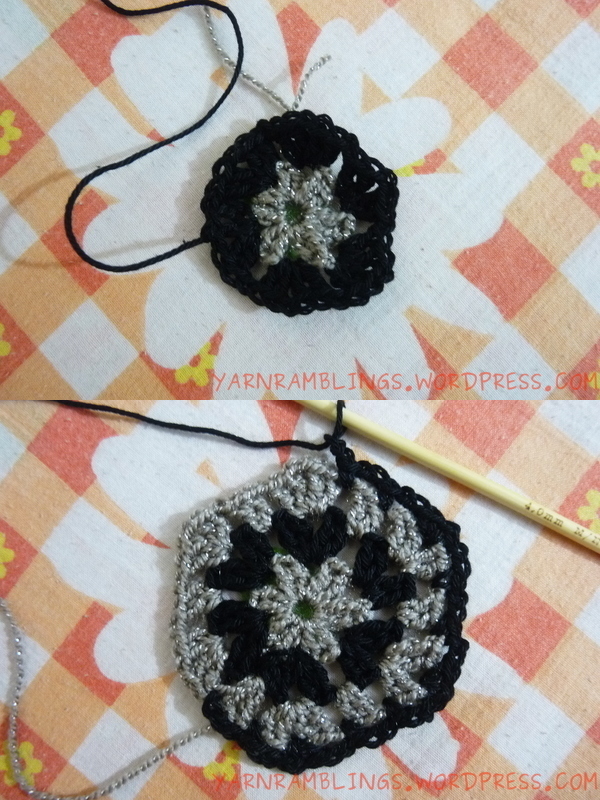 In fact, it looked like a medallion (I forgot to click a picture of that) because I’d done chain stitches between the ‘petals’ of the flower, but then I didn’t like how it looked, unraveled that row, and made single crochets between the petals instead. Now, this looks much better. And now that the photo-blog’s started, I can go back to knitting my cardigan in peace.